Note: This product requires the use of Six Gun from Deep7. 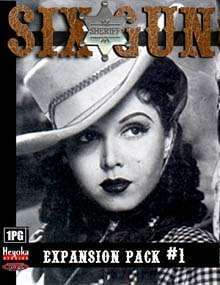 Have you used up all the scenarios from Six Gun yet your players are asking for more? Supplement your westerns with five new scenarios for your posse! "Crooked Iron": A crooked judge, a lawman on the take and a gang of villains spell trouble for the town of Iron Flats. "Geezer's Gold": Old Bill was always thought crazy until he brought a fist-sized chunk of gold ore into town. Bill was gunned down behind the saloon clutching part of a map that everyone believe leads to his motherlode. "A Knife for Jimmy Northwind": A prostitute lies dead with a slit throat and suspicion falls upon a surly halfbreed whose bloody knife was found on the scene. "Mountain Vengeance": A renegade furrier and hunter is squatting upon a mountain owned by a lumber company and the boss wants him evicted before he causes any more trouble. "A Pound of Horse Flesh": Animosity is brewing between the town of Little Butte and a nearby indian village over the theft of horses in the face of poor crops and hunting as winter sets in. This title was added to our catalog on September 01, 2007.